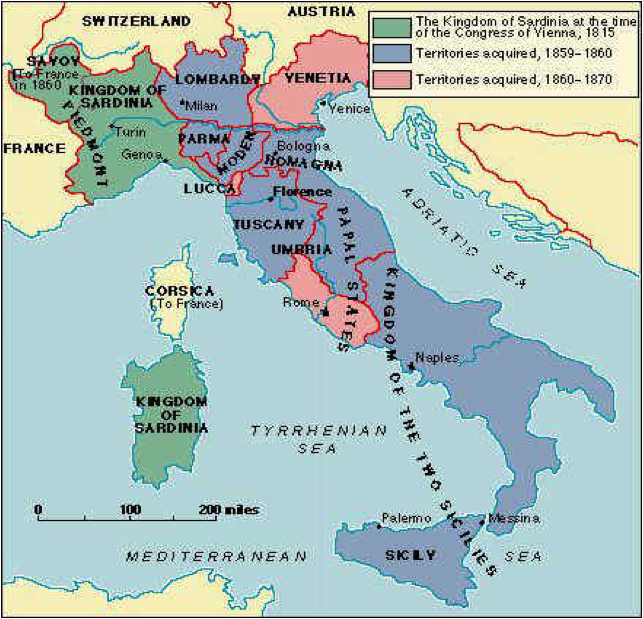 Italy adhered to the Triple Alliance with Germany and Austria in 1882, but after 1900 Italian foreign policy tended toward closer ties with France and Great Britain. 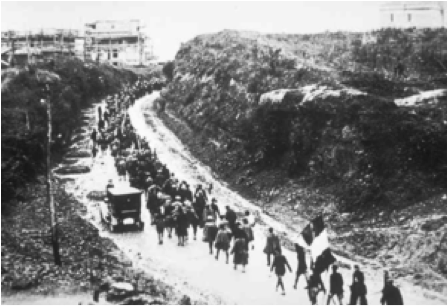 At the outbreak of World War I in 1914 Italy declared its neutrality, explaining that under the Triple Alliance its commitments were solely defensive in nature. Whereas the Giolitti government opposed entry into the war, public opinion, urged on by the popular press, democratic sentiment, and Irredentists who saw the war as an opportunity to complete the Risorgimento, prevailed. Under the terms of the secret London Pact Italy was promised the Italian-speaking areas still held by Austria as well as colonial concessions. Accordingly in May 1915 Italy declared war on Austria. Psychologically Italy was conditioned for war, but the Italian armed forces were woefully unprepared. By the end of the war Italy had mobilized more than 5 million men, and more than 600,000 had been killed. But Italy’s case was poorly presented at the Versailles Conference and its bargaining position compromised by unstable conditions at home. Under the terms of the Treaty of St. Germain in 1919, Austria surrendered Istria, Zara in Dalmatia, Trentino-Alto Adige (South Tyrol), and the Brenner Pass. However, the extravagant offers made in the London Pact were held to be contrary to the spirit of Woodrow Wilson’s Fourteen Points, and the United States refused to support further Italian territorial claims. For many Italians it seemed that the gains won on the battlefield at such great cost had been thrown away at the peace table, and a sense of frustration and disillusionment and of betrayal permeated the country in the years immediately after the war. Italy was saddled with an enormous war debt. Inflation and shortages of basic goods triggered strikes that paralyzed large segments of the economy. Demobilized troops swelled the ranks of the unemployed. Profiteering, often involving public officials, took its toll on public confidence in the government. Socialist gains in local elections inspired fears of expropriation especially among small landholders and outbreaks of violence and counterviolence. The government admitted its inability to maintain public order, and amnesty granted to striking workers confirmed the middle class in its belief that the parliamentary government was not only corrupt but weak. This was the atmosphere that spawned Benito Mussolini’s fascist movement, which for nearly one-quarter of a century demeaned and demoralized Italy’s national life. Mussolini had always been a political maverick. Imprisoned and exiled for his political activities, the schoolteacher-turned-journalist from Romagna had begun his activist career as a pacifist and anarchist, later joining the militant wing of the PSI at one time being the editor of the party’s official newspaper. 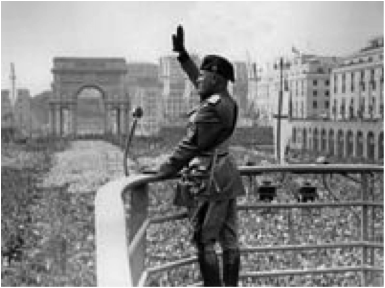 Mussolini broke with the party on the issue of entry into World War I and abandoned Marxism for nationalism. Mussolini was a manipulative orator; his showmanship was not mere buffoonery but struck a responsive chord in his listeners. He had attracted a personal following as early as 1917. In 1919 he assembled the paramilitary Combat Groups (Fasci di Combattimento), called the Blackshirts, from among army veterans and youths, modeled after the arditi (commandos), the shock troops of the Italian army. Organized in more than 2,000 squads, the Blackshirts were used as strike breakers (subsidized by industrialists for the purpose), attacked Socialists and Communists, whom they claimed the government was too timid to deal with, terrorized left-wing town governments, and set up local dictatorships while the police and the army looked on often in sympathy. Mussolini profited from the anxieties of the middle class their businesses threatened and their savings wiped out by inflation and from the small holders’ fears of expropriation by the Socialists. —Benito Mussolini, Giovanni Gentile, Doctrine of Fascism (1932). 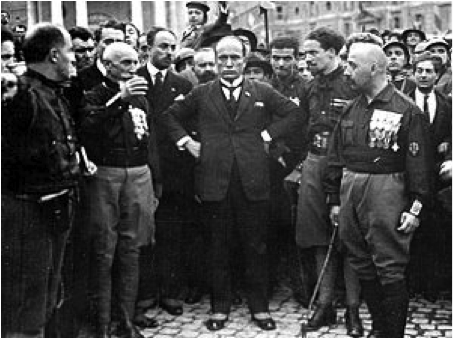 Italy witnessed significant widespread civil unrest and political strife in the aftermath of World War I and the rise of the Fascist movement led by Benito Mussolini which opposed the rise of the international left, especially the far-left along with others who opposed Fascism. 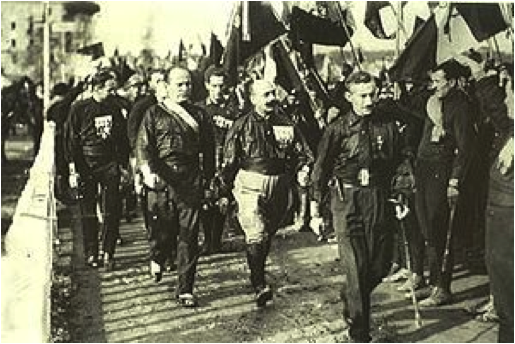 Fascists and communists fought on the streets during this period as the two factions competed to gain power in Italy. 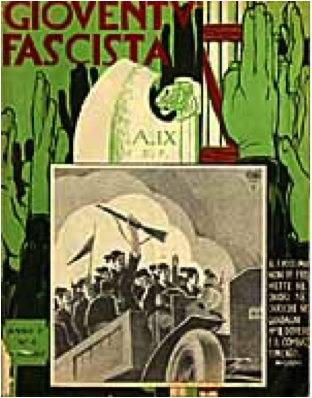 The already tense political environment in Italy escalated into major civil unrest when Fascists began attacking their rivals, beginning on April 15, 1919 with Fascists attacking the offices of the Italian Socialist Party’s newspaper Avanti!. 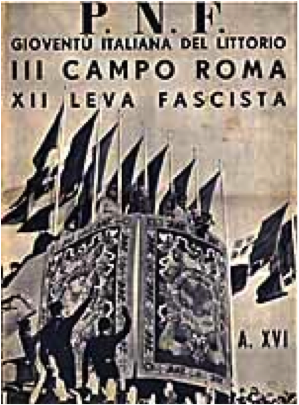 Violence grew in 1921 with Italian army officers beginning to assist the Fascists with their violence against communists and socialists.With the Fascist movement growing, anti-fascists of various political allegiances (but generally of the international left) combined into the Arditi del Popolo (People’s Militia) in 1921. With the threat of a general strike being initiated by anarchists, communists, and socialists, the Fascists launched a coup against the Italian government with the March on Rome in 1922 which pressured Prime Minister Luigi Facta to resign and allowed Mussolini to be appointed Prime Minister by the King Victor Emmanuel III. Two months after Mussolini took over as Prime Minister, Fascists attacked and killed members of the local labour movement in Turin in what became known as the 1922 Turin Massacre.The next act of violence was the assassination of Socialist deputy Giacomo Matteotti by Fascist militant Amerigo Dumini in 1924. This was followed by a Fascist takeover of the Italian government and multiple assassination attempts were made against Mussolini in 1926, with the last attempt on October 31, 1926. On November 9, 1926, the Fascist government initiated emergency powers which resulted in the arrest of multiple anti-Fascists including communist Antonio Gramsci. Afterwards serious opposition to the Fascist regime collapsed. Mussolini has been credited for the long presence of the fascist regime within Italy, which lasted twice as long as the Nazi regime in Germany. Fascism played a significant role in the process of industrialization and creating a new working class. However the movement somewhat failed to satisfy the new proletariat which was mainly composed of peasant workers, who commonly returned to their farms. This highlighted the inability of the regime to turn the peasants into dedicated fascists – a result of strong traditional values prevalent in Italy at the time. In 1935 when Mussolini initiated the Ethiopian War, which many believe was a waged war for unjustifiable reasons, many became skeptical of his interests. As stated Mussolini was possibly “the crudest and most irresponsible of international aggressors” (Bosworth) following the war . This, coupled with the alliance with Nazi Germany, was affecting the popularity of Mussolini and his regime. For many, liberties declined as fascism was “abolishing parties, free press, the public accountability of government, and every free expression of public opinion” (Passerini). Giovinezza in Marcia. Three children’s school notebooks, 1935. Children were required to use these notebooks with colored Fascist cartoons and quotations from Mussolini on the front and back. Two are for instruction in French; the third seems concerned with penmanship or simple composition. Gioventù Fascista. Rome, April 1931. A propaganda magazine designed for young Fascists and featuring stories and cartoons praising the regime. P.N.F. Gioventù Italiana del Littorio. III Campo Roma. XII Leva Fascista. 1938. A special issue to commemorate the twelfth encampment of Fascist youths, 52,000 strong, from the very youngest four-and five-year-olds (the Figli della Lupa) to the Fascisti Universitari. The issue includes many photographs of Mussolini and famous quotations. La Rivista Illustrata del Popolo d’Italia. Milan, 6 June 1926. This pictorial magazine founded by Benito Mussolini and directed by Arnaldo Mussolini (the Duce’s brother) contains many articles related to the Italian leader and Fascism. The issue shown here includes a famous article on the XVth Biennial Art Exhibit in Venice written by Mussolini’s mistress Margherita Sarfatti, who played a major role in the Duce’s cultural development. Frank and outspoken in her criticism of the pressure brought to bear on the show’s organizers to show only established masters, she singles out for special praise a painting by the Austrian Oscar Kokoschka, whose avant-garde work would in a few years’ time be branded as degenerate and removed from German museums. Orazio Pedrazzi. La Conquista della Libia. Florence: R. Bemporad e Figli, n.d. but ca. 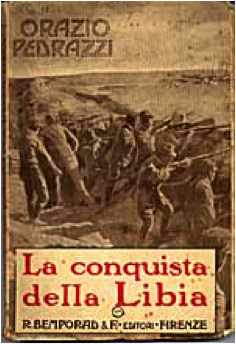 1930.This book for young readers recounts Italy’s conquest of its oldest colony in 1911-1912 (although the text is remarkably free of dates). The book offers the usual justifications for this and later colonial adventures — namely, that « civilized nations have not only the right but also the duty to dominate these barbarous countries and bring to them the light of human progress. » Many black-and-white full-page reproductions of paintings glorify the actions of Italian soldiers. La Conquista della Libia. Florence: R. Bemporad e Figli, n.d. but ca. 1930. Fasci Italiani all’Estero. L’ Abissinia e Noi. 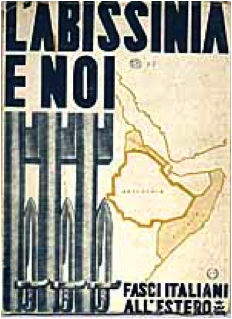 Rome: Tipografia Regionale, 1935.An official publication of the Fascist regime justifying Italy’s claims to Abyssinia (Ethiopia) on the eve of the conquest: a congeries of backward, poorly governed feudal entities, Abyssinia is seen as presenting grave danger to the Italian colonies of Eritrea and Somalia. The publication describes in some detail the battle of Adua. Fasci Italiani all’Estero. L’ Abissinia e Noi. Rome: Tipografia Regionale, 1935. Azione Imperiale. Rassegna della Creazione Fascista. 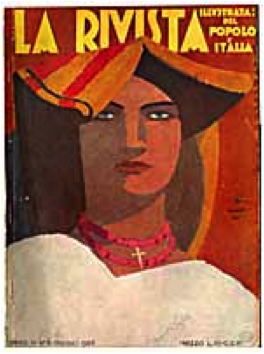 Rome, August 1936.The first issue of a monthly magazine devoted to culture under the regime and directed by a leading literary figure, Futurist writer F. T. Marinetti. 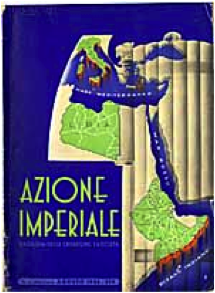 The present installment dwells on imperial themes, and the cover carries a map of Italian Africa.Azione Imperiale. Rassegna della Creazione Fascista. Rome, August 1936.